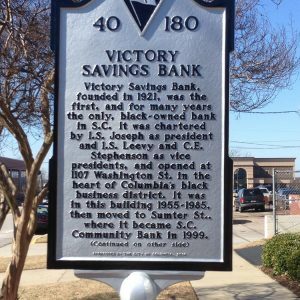 Victory Savings Bank, founded in 1921, was the first, and for many years the only, black-owned bank in S.C. It occupied a bank building at 1107 Washington St. in the heart of Columbia’s black business district from 1955 to 1985. It was moved to Sumter St., where it became S.C. Community Bank in 1999. Dr. Henry D. Monteith, who became president in 1948, led the bank for many years. His sister Modjeska Monteith Simkins, notable civil rights leader, held several positions here. This bank offered loans to blacks after widespread economic reprisals, many related to the Clarendon County school desegregation case Briggs v. Elliott.